Is Your Company Ready for Health Care Reform? In a bipartisan legislative framework released today, millions of illegal immigrants would be given a path to citizenship. Most people in the country illegally could qualify for legal status and work permits, so long as they met certain criteria, such as a background check. The framework would also strenghten rules to make sure companies hire legally. The U.S. Court of Appeals for the D.C. Circuit has invalidated three of President Obama’s appointments to the U.S. National Labor Relations Board on constitutional grounds. In Noel Canning v. NLRB, a unanimous court held that the appointments of Sharon Block, Terence Flynn, and Richard Griffin to the NLRB on Jan. 4, 2012, were not valid “recess” appointments under the Constitution. The court’s decision casts doubt on hundreds of decisions the NLRB has mde in the past year, including enforcement of collective-bargaining agreements and the rights of employees to use social media. Which sales methods work best today? 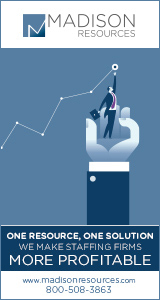 How should staffing professionals educate clients on how to buy staffing services? John A. Thomas, CTS, CSP, vice president of partner development for Nextaff, will answer these questions during the ASAPro webinar “Reaching the Decision Maker—Successful Sales Techniques for 2013,” Tuesday, Jan. 29, 3–4 p.m. Eastern time. Learn about the tools and techniques that some of the most successful sales professionals use today to uncover prospects and close more sales with current and new clients. The webinar qualifies for continuing education hours toward ASA certification renewal. Register online at americanstaffing.net. ASAPro webinars are $295 for nonmembers. Join ASA and enjoy ASAPro webinars for FREE. As the leader in staffing industry advocacy, ASA has been hard at work to mitigate the effects of the Affordable Care Act on staffing companies. The 2013 ASA Staffing Law Conference, May 7–8 in Washington, DC, will deliver the latest information, strategies, tools, resources, and expertise on all the most pressing legal and legislative issues affecting the staffing industry—including health care reform. The ASA Staffing Law Conference will feature a special session, “Health Care Reform Panel Discussion—What Are Staffing Firms Doing to Prepare?” This discussion will be led by ASA senior counsel Ed Lenz, the industry’s leading expert on the new law. 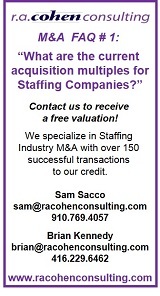 Learn more and register today at americanstaffing.net.